SOW: What time did you have to get to the studio for your 9:40am appearance? JP: My taxi arrived at home at 5:50am. We arrived at 6:15am and set up the rehearsal and live performance ingredients straight away with the home economist, Yasmin. Same plates for both, everything in the same place each time etc. SOW: Did you have to wear makeup? JP: Yes - as soon as we finish the rehearsal (at 6.30am), we went straight into the green room and were then summoned into makeup. There are so many lights and cameras around that makeup is essential to make us look real on screen! Apparently Mac 4 suits my skin best. The things you learn to accept in show biz!!! SOW: Do you rehearse beforehand with the hosts or on your own? 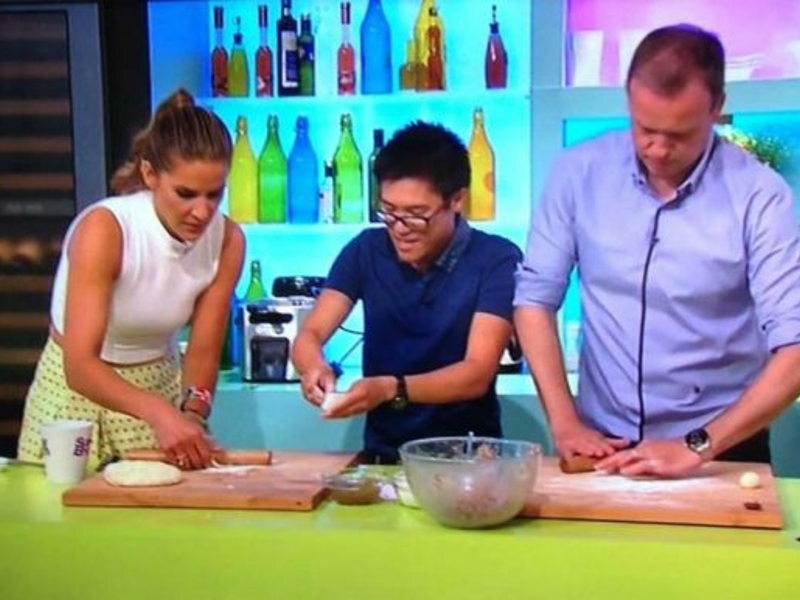 JP: The first time on Sunday Brunch, Simon and Tim were both around and we rehearsed before hand with them. This time Simon was away, so things ran slightly differently. I rehearsed with the crew acting as Tim and Amanda - quite strange, but very relaxed. It's more about getting the timings right to ensure we can get everything covered in the time allocated. SOW: What's the hardest thing about cooking on live tv? JP: Timings - It's very difficult to cook anything in 10 minutes, let along 2 dishes or something really complicated which has the 'wow factor'. I don’t tend to swear that much in real life, so that's not as difficult as a chef like Ramsay for example...The other really difficult thing is when there are presenters on with you, they tend to like to ask lots of questions, but that can't get in the way of the limited time. So you have to answer them whilst continuing to cook, and of course explaining what you are doing in between... which may be why I have such a motor mouth when on TV! SOW: What's the easiest/most fun? JP: The easiest thing is that the crew tell you exactly what they need, no beating around the bush. The most fun - meeting all the amazing people who I never thought I would meet, like Richard Whitehead for example. Meeting an olympic gold medalist is quite inspirational. I also really enjoy the rewarding feeling of making people smile with food, whoever they are, they seem to enjoy tucking in. I guess the simple satisfaction shows when someone is tucking into your food and thoroughly enjoying it, whether on TV or not... that's something I know I can guarantee nowadays, which makes me smile. SOW: Any weird/interesting behind the scenes info about the hosts or program that viewers would be surprised to hear? JP: It seems that there are more people running in and out of the green room and back to reception to keep guests happy than there are on the actual filming floor. As with anything in hospitality, there is such a lot of work that goes into keeping guests happy! SOW. Is there booze in the green room? If so, does it help?